Located on the western shore of Lake Mirror, Valeria is probably the most mysterious fortress city you will ever visit. All three names have their basis in fact. The city was originally founded as a colony of Freen that was completely destroyed in the war against the Great Old Gods, where all residents and attackers perished together in the inferno. It was the first encounter of the Young Gods against the Great Old Ones, and took place over 5000 years ago. 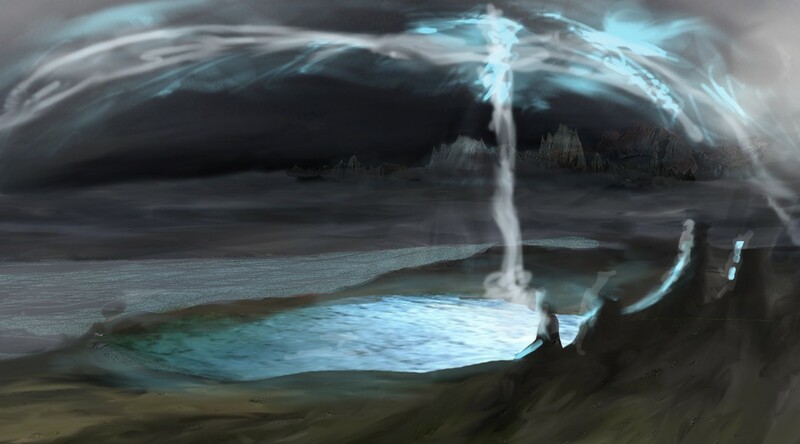 As the battle continued over several days, so much magical energy accumulated that it was discharged over the city and the resulting heat melted even the stones, leaving a nearly circular plane of glass. Hundreds of thousands on both sides died. After the war, humans with the help of Aquans built a new city on the glass plane. Since there were no quarries for hundreds of miles around, the Aquans built an underwater quarry on the western shore of Mirror Lake. The glass turned out to be so hard that they did not need to lay a foundation on it. The Aquans of the lake and the people of Valeria have had an eternal alliance since that time, celebrated once a year during the rainy season on the Grand Market Plaza. The Aquans dry out easily if they are out of water for more than one hour, although they can survive up to four hours on land. A huge sculpture stands on the plaza, presented by Flossom the Aquan leader to Ueli von Bergen, the Duke of Valeria, for the cornerstone of the old city walls. Human life on Mirror Lake is more strongly oriented towards the water than other strongholds. Fishing, eel farming and freshwater seaweed cultivation play an important role. Thus it’s no surprise that the Valerian diet is spiced with fruits of the sea that are widely available, including smoked eel, seaweed soup, and Valerian bouillabaisse. In the nursery, however, a completely different Valerian specialty has arrived: the Valerian puzzle. It consists of inch-wide stones mined from the underwater quarry. Except for the border pieces, each cube-shaped block has four combinations of pegs, holes, hooks and eyes which, if you put them together correctly, make an image of a god with its attributes. Parents like to buy these puzzles in order to teach the pantheon of deities to their children. A more difficult version, the Valerian thinking puzzle, allows you to rebuild the temples of the gods, and this enjoys steady popularity among adults.